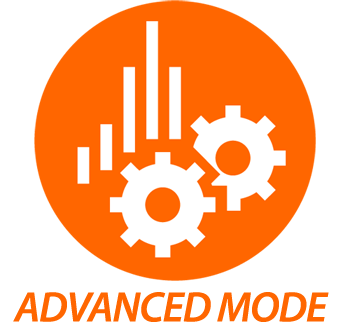 Must Have 1-CLICK Automation Wordpress Plugin. Does 30 minutes of boring wordpress tasks in 2 minutes. Every Wordpress Site on the planet needs this. Deleting all the default posts and comments. Removing all those sample pages. Doing all the wordpress general settings. Having the right SEO settings so your site shows up in Google. 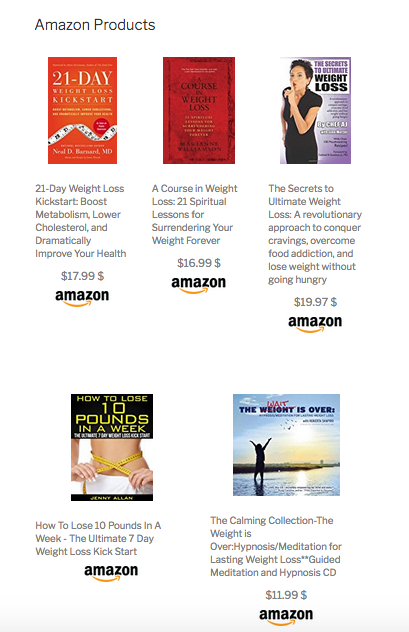 Adding important things like affiliate disclaimers, amazon disclaimers, copyright pages and many more. Installing all the important plugins you need to have on the site. Creating all the categories, posts and pages you need on your new site. AND many more such boring tasks that you would rather not do. 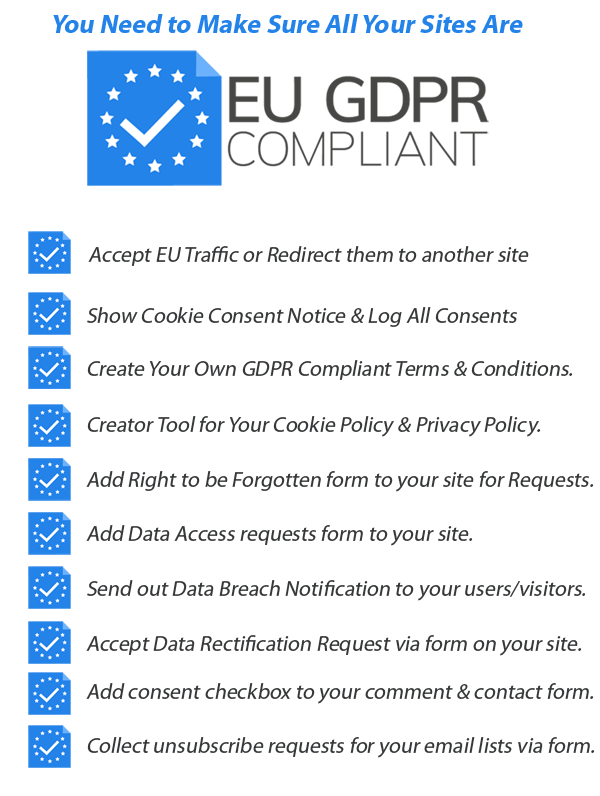 Now adding all these things can actually take you another 3 to 4 hours to create all the right pages for GDPR Compliance. All these menial tasks can really add up and they can take a lot of time on each site for you to setup. In fact, we actually asked a few Wordpress experts about how much time it takes them to do these. ...on average it takes them 30 minutes to finish just the wordpress tasks one by one. And then another 3 to 4 hours to make all the pages for GDPR compliance now that its mandatory. Wordpress has way too many places you have to go and set these things up you know! I really wanted to have something SIMPLER that could do EVERYTHING in a few seconds for me. 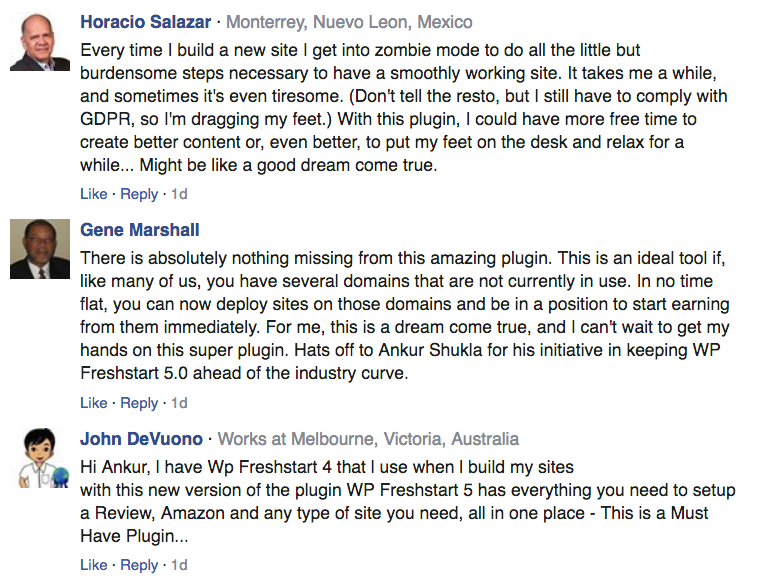 And that’s why I created WP Freshstart 5.0! Really...The sky is the limit. YES - Now You Can Set Up Your WP Site In Just 30 Seconds! Imagine spending Just SECONDS (instead of HOURS) setting up your WP site(s). We’ve made everything extremely simple! And BOOM! All your 30+ tasks will be DONE in under 2 minutes, right in front of you. No more spending 3 to 4 hours doing boring tasks manually! This is super simple. 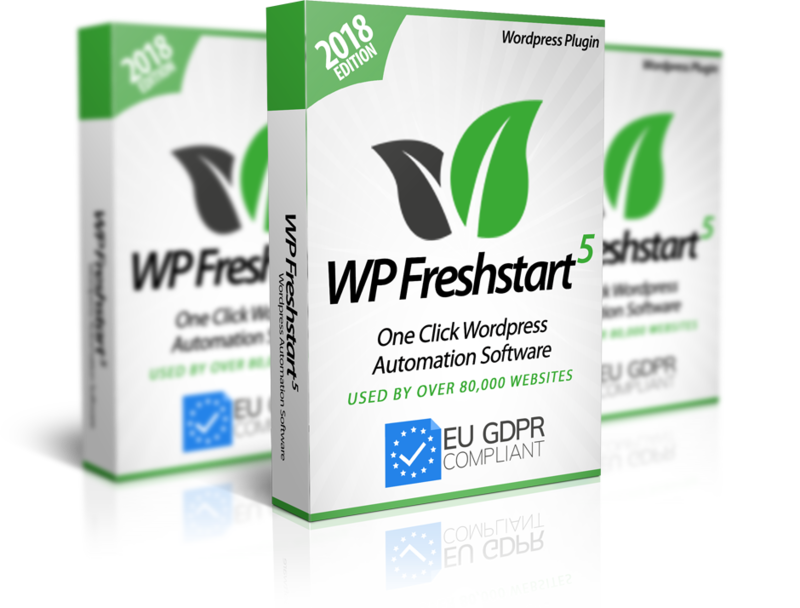 Step 1 – Go to GDPR Section inside WP Freshstart 5.0. Step 2 – Enter your Business Information. 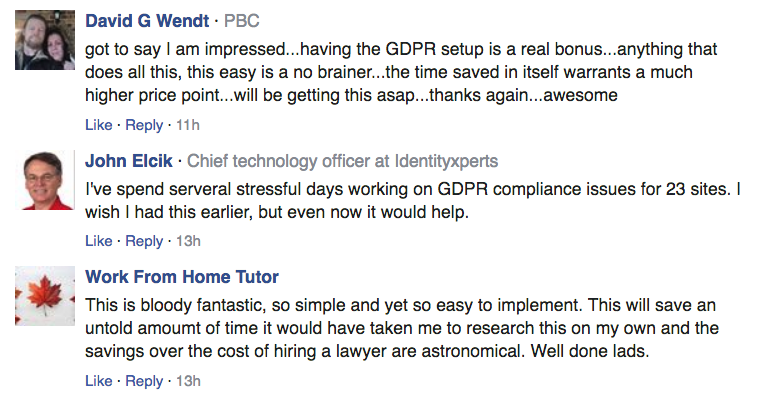 We even have Step by Step Wizards of making the perfect GDPR Ready Pages for you. 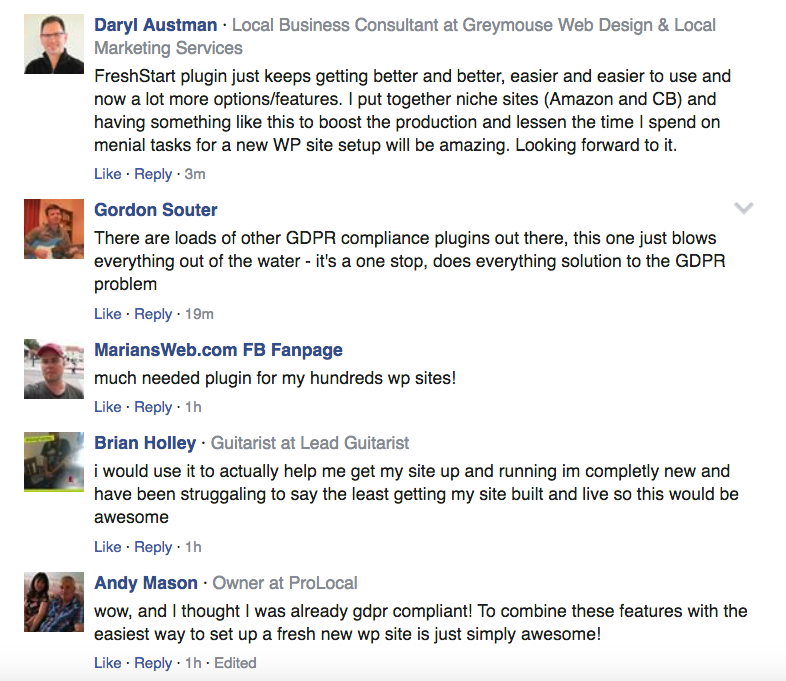 Getting your site to GDPR Compliance now takes just 2 minutes. In just one single click – your old bloated, good for nothing site will be turned into a fresh, new wordpress blog that will feel like you just installed a new wordpress on it BUT without having to re-install WP all over again. 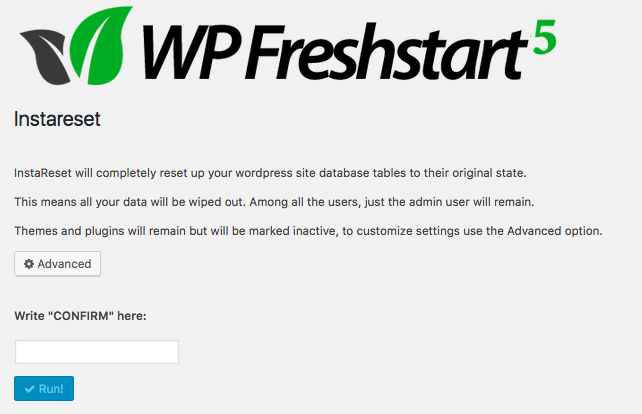 Step 1 – Go to InstaReset inside WP Freshstart 5.0. Step 2 – Type in "CONFIRM" and hit RUN. 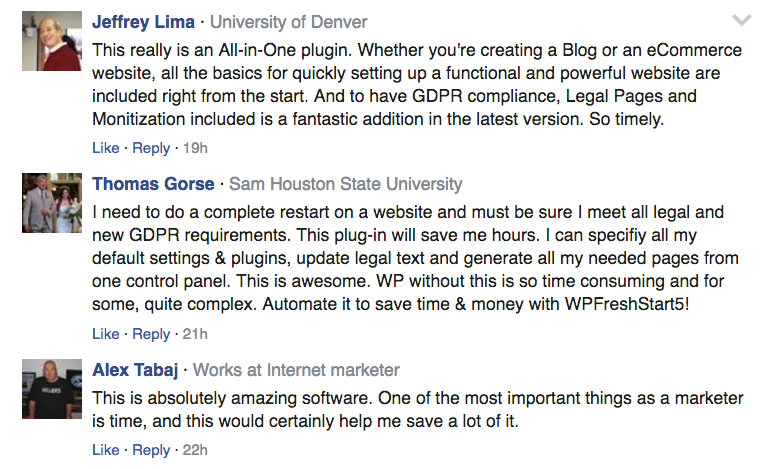 This gives you a super EASY FIX to reset any wordpress site to its original state. Getting rid of all the junk in just ONE CLICK. PLUS New GDPR & Monetization Features Added based on customer requests. MONEY MAKING : Automatically add affiliate links within text for any offer. 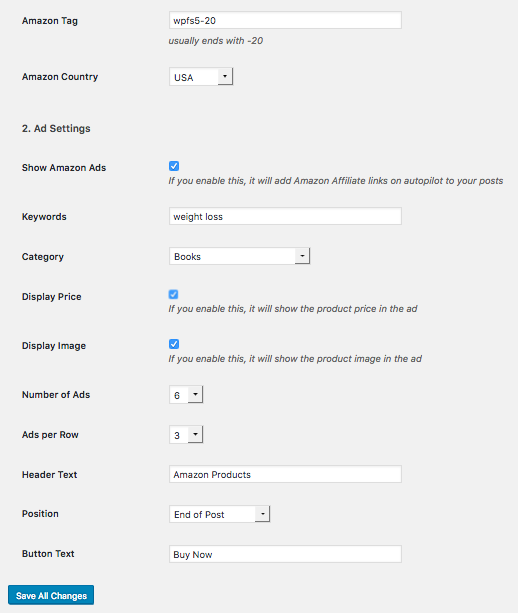 MONEY MAKING : Automatically add Amazon Affiliate Products under your blog posts. SITE SETUP Actions - Quick Mode to setup your site in 2 minutes. 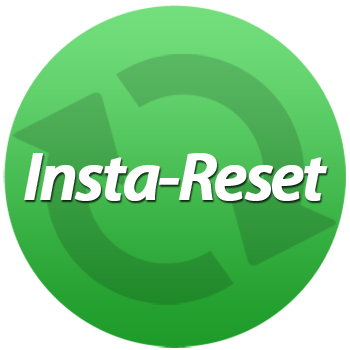 INSTA-RESET : Instantly reset your WP site to a fresh wordpress install. That will do 30 menial WP tasks in just 2 minutes flat! Create must have pages like about us, contact us etc. PLUS ALL THE NEW 5.0 FEATURES listed above. I have been building wordpress sites since 2002 and it takes me 30 minutes per site every single time. 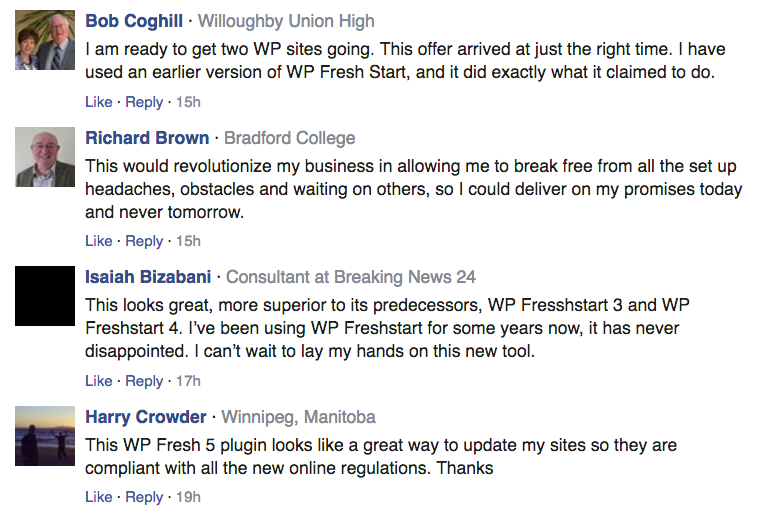 But WP Freshstart does it all in just 2 minutes. The ADVANCED MODE and the QUICK MODE are 2 modes to run the WP Freshstart plugin now in v5.0 that lets you control more settings and do everything from a single screen without hopping all over your site admin area to setup your site. Have an old wordpress site that you want to reset and make like a brand new one but have been dreading re-installing wordpress all over again? Watch How To Use Our Plugin by Watching What We Do. We have created step by step walkthrough training videos that show you exactly how to install and use this plugin. Just watch what we do and do the same at your end and you will never be lost of left wondering how to use our software. Learn how you can implement this passive income system to generate upto $100,000 per year in passive income for yourself. This is already working for many people and you just have to watch this and take action. 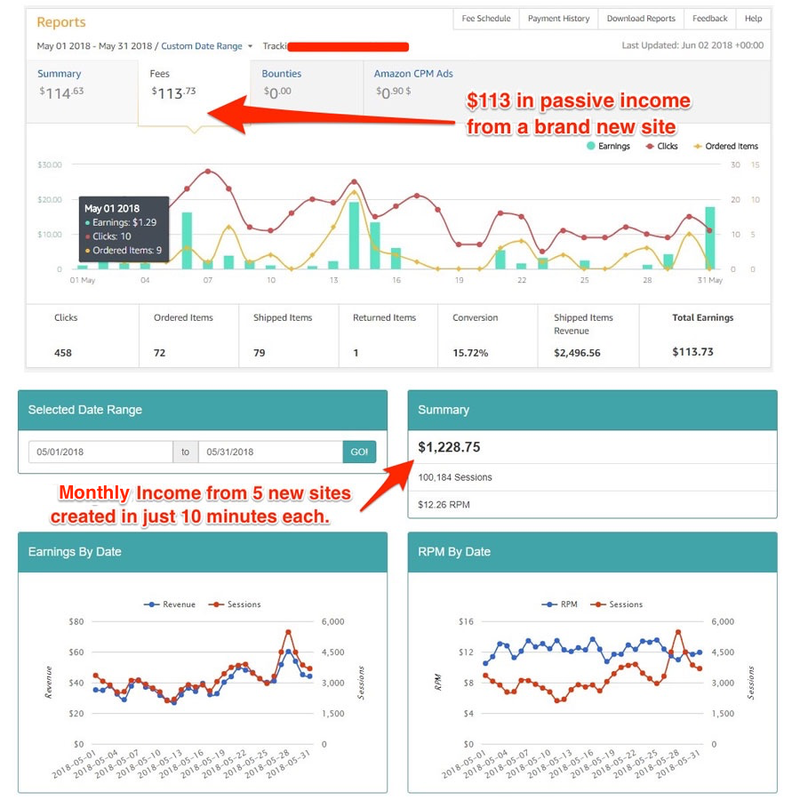 Learn exactly how two secret experts are getting over 3000 unique visitors to your site PER DAY without spending a dime, yes this is all free traffic and you will learn exactly how you can copy that. HURRY - LIMITED TIME DISCOUNT! HURRY - Price jumps to $37 soon! 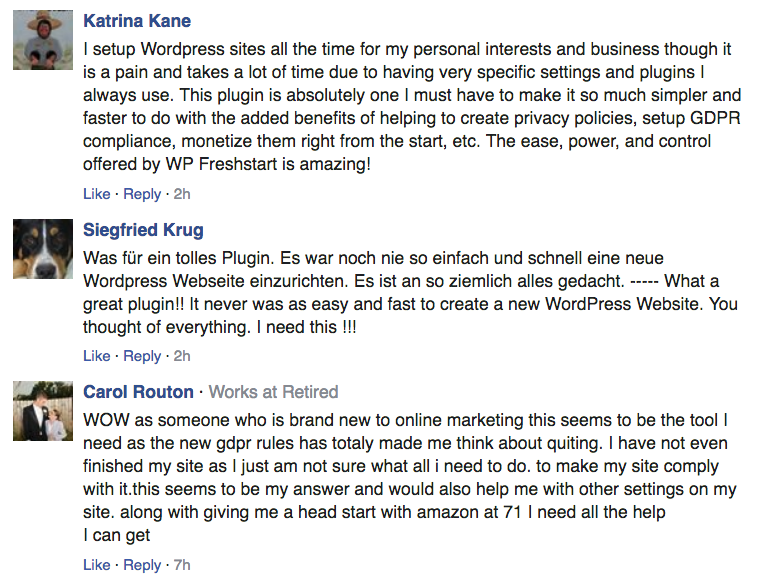 If you have any technical issues while using the WP Freshstart 5.0 plugin and we fail to help you resolve the issue, we’ll give you 100% of your money back. 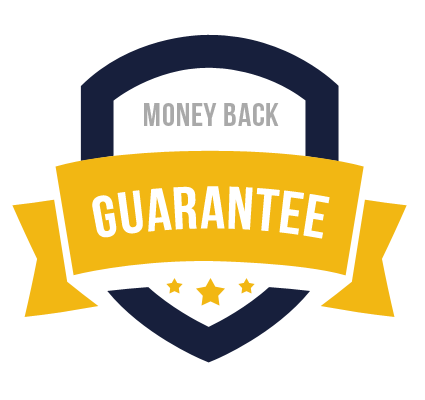 Our moneyback guarantee applies to all technical issues only – other than that, all sales are final. As long as you provide a valid reason for requesting a refund, we'll consider it. Our team has a 99% proven record of solving customer problems and helping you through any issues they have so you’re extremely safe & your purchase is protected. If you file a dispute or chargeback without contacting us first for support, that will void all guarantees. P.S. This is a must-have plugin for every wordpress site. You or your staff is probably wasting hours every week on tasks that this will do for you in seconds. So STOP wasting your precious time on menial tasks and let WP Freshstart take care of all the grunt work for and free up your time. Yes! We built this so that anyone, even newbies could use this. 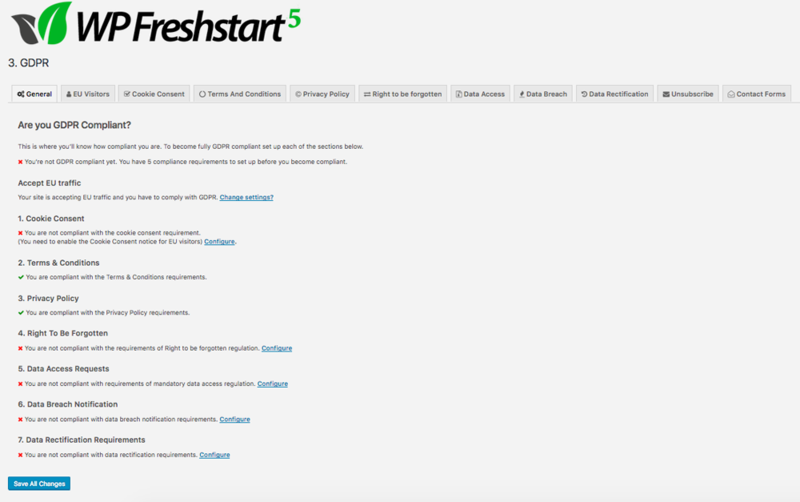 Literally all you have to do is select a few options and then click ONE button and WpFreshstart 5.0 wll go to work for you. And just in case you run into ANY problems, we have step by step training videos to guide you every step of the way. Q: What license rights do I have to this software? For this offer on this page, you're getting personal use rights only. 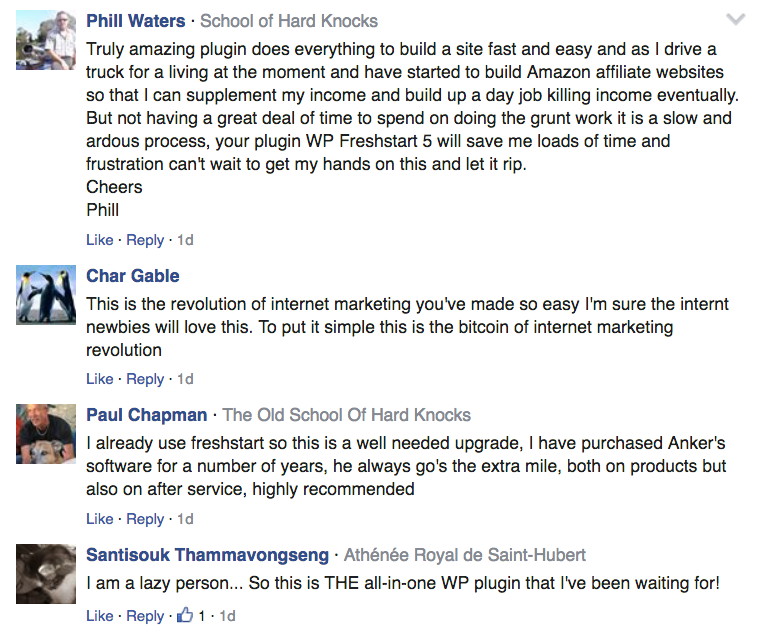 This means you can use this plugin for your own sites when you buy the product. Q: What types of sites can I use this on? 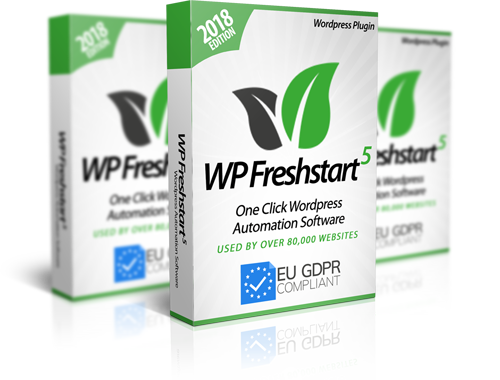 WP Freshstart 5.0 works for ANY type of site: Amazon niche sites, Facebook sites, offline/local business sites, Adsense sites, affiliate review sites, sites for your own products, etc. Q: Does this work on Mac and PC? Yes! Since this is a Wordpress plugin, this will work when using ANY computer really :) All you need is wordpress on your site. Q: Do you walk me through how to install and USE this software to its full capability? Yes absolutely! We have included over-the-shoulder video training for you so that can easily install this software and start taking advantage of this awesome plugin. Absolutely not. We built this so you wouldn't have to deal with any of that tech mumbo jumbo. Q: Will InstaReset delete everything from my site?